Saturday, I spent an hour listening to students practice their pieces for an upcoming piano recital. The kids were respectful. They watched and listened to each other; the youngest learned to approach the bench properly and how to bow after completing their pieces. The two boys started yapping. Together they tossed out numbers. In perfect unison. It was like some weird mathematical duet. “I memorized the first 13 numbers after the decimal,” my son said. So that is how I came to learn that today – 3.14 – is Pi Day. Just imagine how amazing this will be in a few years. Like on 3.14.15 at 9:26 am when 8 digits represent in order! Something tells me a lot of folks will be eating pie in math class on that day. But let’s celebrate today. The now. And now, let us sing! This entry was posted in Education, Humor and tagged 3.14, @RASJacobson, education, Family, how did an English teacher get a math/science kid?, Humor, infinite numbers, kids who love math, Learning, Math, pampering, Perimeter Institute for Theoretical Physics, Pi, Pi Day, Piano, Specific Numbers, teaching, Unison, Video, writing. Bookmark the permalink. Happy Pi day to you too! As a math teacher, I would love to celebrate it with my students, but it almost always (this year included) falls during our Spring Break. Unfortunately, 3/14/15 is on a Saturday. 😦 Still won’t be able to celebrate with my students. Oh no! That is a disaster! But leave it to a math teacher to have already figured it out! Take heart. I’m sure millions of math lovers will be sprawled about, all over the world, watching some digital device… waiting. Perhaps there might be a special convening of The Pi Club on that day held in a local library. I bet a lot of people would actually attend. I know they have contests to see who knows the most digits by heart. So many things one could do. 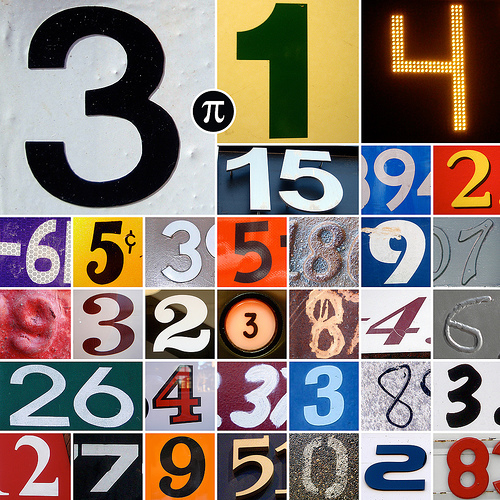 You could celebrate Pi Day on the Friday, though, when it’s already 3.14.15 across the dateline in Asia. I didn’t even plan my wedding this far in advance. And I’m an English teacher. I’ll just make an ungraceful exit now. I swear I thought about the whole Asia thing, and then I realized I chose to write about Pi when tens of thousands of people are actually suffering in Japan. Right now. So I’ll just make my ungraceful exit now. First. I think it’s very cool to celebrate PI day. My daughter came home from school last year all aglow about PI day, and I had no idea what she was talking about. I got the “Srsly mom” look, and I said, shrugging, “Well, we didn’t celebrate PI day or cool things like that when I was in school.” We didn’t. So, more power to the math people (or, more power to the math, people) for getting kids’ interest and having a little bit of fun with numbers! I thought Pi day was a creation of Papa Johns, Dominos etc. so we would all eat pizza pie today. There are in fact two Pi Days in the year. March 14th and 22 July, the closest fractional representation of Pi being 22/7. Having said that, 22/7 is 3.1428, and March 14th 2028 is a Tuesday, so Ms H could celebrate with her students then (assuming she’s still teaching then). Doesn’t 22/7 that imply she would be teaching in July? I’m thinking she’s not. I have absolutely no business posting on this topic at all. I should just stick to apple pie. Thank goodness you and lowsalt understand each other! And only 17 more years until you do the whole Pi/pie thing with your students. Just think of how much material you can gather until then. It just so happens that my son’s 14th birthday is today! We are big fans of 3.14 Pi day and birthday! I happen to love math, so it was a great day when he learned in school that his birthday is Pi. Proud moment for me! Thanks, as always, for sharing, Renee! The circle is a complete anomaly. It is a symbol of wholeness, a boundary, a completeness. It is a finite space. Yet pi is infinite. Finite and infinite at the same time? No, I already read everything Herman Hesse ever wrote so the answer is not there, that’s for sure. I guess someone has to leave the stupid Charlie six-pack male comment so here goes: I stick with apple or pecan, thank you very much. Math makes my head hurt… but the Pi song you posted (and the otherworldly composition which converted the digits to notes which is causing a bit of a copyright hubbub on NPR and YouTube today) are very cool. I prefer Star Wars Day – May the Fourth be with you! Oops! Thanks for picking me up, Clay! I did not know about pi day, but if I had I probably would protest on general grounds that I think pi has something to do with math, which I don’t believe in. I’m a matheist. Someone tried to tell me once that pie are squared. Whilst I am no form of mathematician (I still use my fingers to count), I absolutely endorse the celebratino of unusual and fun events! The math teacher announced in the staff lounge that today was Pi Day and informed all that he brought in pies for the kids to possibly throw in his face….then he [a little too obviously] paused waiting for someone to insert their foot into their mouth and ask a form of stupid. I have learned, thanks to many foot inserting moments, that silence is best left alone and quickly figured out what he was referring to was a day to celebrate 3.14 and not the Betty Crockers. That could’ve been awkward. Thanks for posting the song! Glad you enjoyed, botut. And, as you can see, my blog is the place to try to “Outwit, Outlast, Outpun” each other.